sweet tooth for tiramisu? i got you covered. this was actually not planned at all. i didn't plan to make this dessert. it came to me through my friend Lola. that i even had to add ladyfingers to my shopping cart. i didn't plan to make this post. and it had to be as soon as possible. i am sure i am not the only one who suddenly feels like eating dessert when i'm on my own... at home... at night... we all do. backing up on one-serving-dessert recipes - and ingredients - will not only bring a solution to all your "oh-my-god it's half past ten in the night and i feel like eating chocolate mousse" moments, but also up your game in the kitchen - and it's not that difficult to adapt them for two in an emergency anyway. Todos os ingredientes devem estar bem frios ou pelo menos à temperatura ambiente. Bater o mascarpone com o xarope de baunilha e o leite de soja e reservar. Misturar o café, o whiskey e a água muito bem. Partir os biscoitos em três e molhá-los na mistura preparada. Montar a sobremesa: começar com uma pequena colherada da mistura de mascarpone, cobrir com dois pedaços de biscoito, fazendo camadas. Polvilhar com canela e disfrutar. All ingredients must be quite cold or at least at room temperature. Beat mascarpone, vanilla syrup and milk together and set aside. Mix coffee, whiskey and water until well dissolved. Break the ladyfingers in three pieces each and soak them in the mixture. 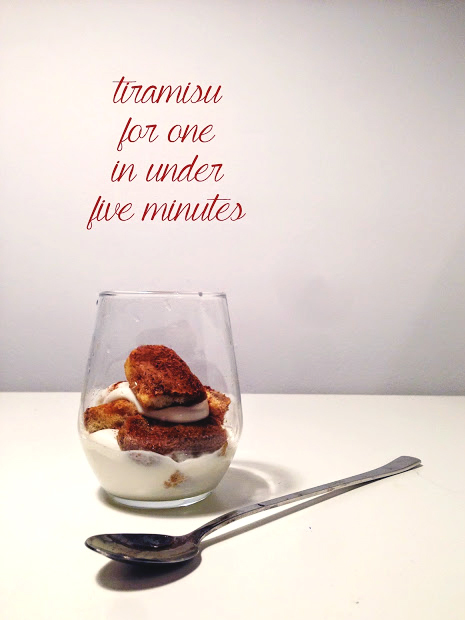 Assemble the dessert: start with a small dollop of mascarpone, cover with two pieces of biscuit, making layers. Dust with cinnamon and enjoy. have a nice holiday tomorrow! Às vezes apetece mesmo um docinho, simples, rápido e delicioso! Parece uma delícia o teu tiramisú!